A quick review of last years cider. I don’t have a lot of cider making knowledge, I try to make a batch a year, it just seems like the right thing to do living where I do. There are numerous orchards with in a short drive. There are even ‘wild’ apple trees along many of my local running routes. This is what it’s like living in converted farm county. I want to learn more about the techniques, and methods to make a more refined cider. In the not to distant future I plan on having a few apple trees. I’m not there yet, so I’m still buying local unpasteurized cider and making simple common cider. Last years batch was a similar recipe to the first year with only minor changes. I controlled the fermentation temperature better this year. Instead of keeping the carboy in the kitchen, I put it in the basement, where it’s much cooler, and doesn’t have the temperature swings we see in New England fall. I changed the sugar type, from turbinado sugar to honey, and increasing the starting gravity to 1.067. This resulted in an abv in the 8.3 range. I also changed the yeast I used for this batch, using a packet of dry us-05 yeast, instead of Nottingham like I tried the first time. Last years cider weighted in at 8.3%, a fairly potent beverage. 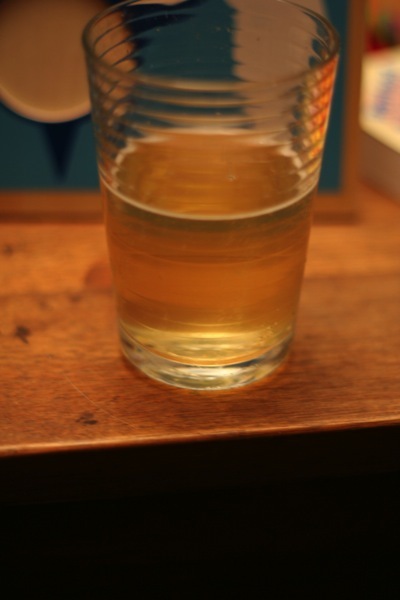 I plan to tweak my next batch of apple cider again, going with a very similar recipe to my pear cider. 1 campden tablet over night, 1/4 tab pectic enzyme, 3/4 yeast nutrient, 3g cider, (1/2 lb local honey? ), Wyeast london ESB 1968, and fermentation at cool basement temps. I’m hoping for something a little less punchy, but with similar crispness. I’m on the fence about the honey, since I’ll have a honey peary too. Future plans will have to wait for another day. The cider is straw like, the picture (left) looks darker than it really is. It’s also very clear, which is well hidden by moisture on the glass. This is a sipping cider. While cold you get nice apple aromas, and a cool crispness, and light carbonation, as it warms you get heat from the alcohol. It has a vinous flavor, with a bit of a wild tang, and a flavor I can’t place. It has a nice mild carbonation, but it is otherwise a little too dry. I think this a good fall beverage, it would go great with a pork roast, or roast turkey. It could use a bit more sweetness, and I wish I had bottled it in 12 oz bottles, instead of 22’s. While I can picture myself enjoying a wine glass or two over a meal, or by the fire, I can’t however picture having this by the pint if that makes any sense. I’m looking forward to comparing this to some other local hand made ciders, perhaps when I get a chance to press some apples later this fall. I’d like to know how my results compare. I am also looking forward to holding onto a few bottles to compare last years batch to the next batch I make to see if I’m making any improvements, only time will tell.